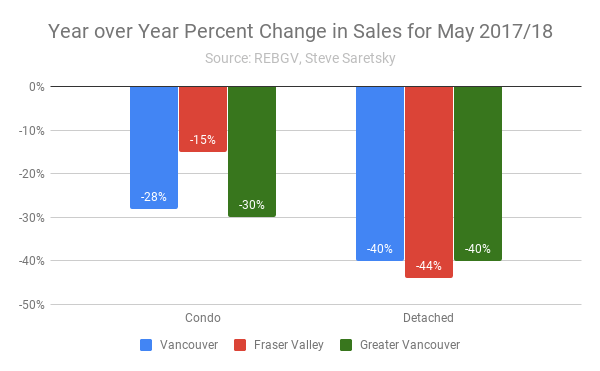 The condo market across Greater Vancouver and into the Fraser Valley suburbs has been carrying the Real Estate market for quite some time. Despite detached home sales cratering to a thirty year low, it seemed condos were somehow exempt. Condo sales remained robust as inventory levels continuously declined lower each month, placing further upwards pressure on prices. As of May, condo prices in the Valley were up as much as 42% year over year. However, that trend appears to be reversing. Condo inventory has climbed higher each month following a ten year low registered in December 2017. While the recent uptick is part of a seasonal trend, the year over year increases have been far from normal. 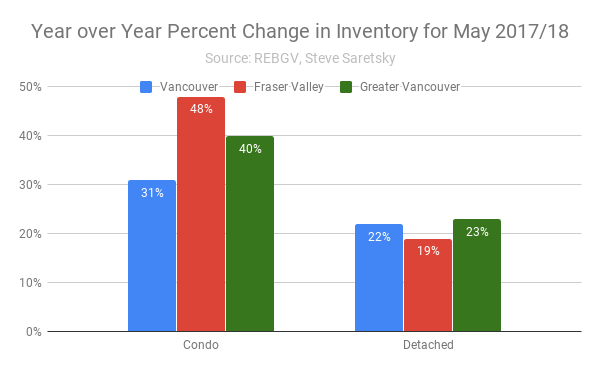 Condo inventory levels increased by an eye watering 40% year over year in Greater Vancouver, and 48% in the Fraser Valley. Condo Inventory growth year over year. This was the single largest percentage increase recorded on a year over year basis since May of 2007. While inventory levels remain below normal levels, it is important to gauge market trends. Inventory has jumped substantially and appears to be trending higher at a time when sales are weakening. Condo sales dropped as much as 30% in Greater Vancouver this May. Percent change in sales year over year. With sales sliding and inventory rising after years of consecutive declines, the condo market now faces both a record supply of new units under construction and housing starts. This sort of pattern reeks of your typical late stage real estate cycle. The once red hot pre sale condo market where investors have been buying pre-sale condos and flipping them through assignment sales appears to be nearing an end. Developers have begun offering a variation of Realtor bonuses, decorating incentives, and creative deposit structures to entice new buyers. “I don’t think you will see as big a line up anymore,” said Schacter. The FOMO – fear of missing out – is dissipating, he suggested.